Throughout November, we have been raising awareness about how important parents are to their children’s academic success. But, it wouldn’t be fair to talk about what parents should do and not acknowledge the challenges they face to stay involved. Last week, I met with four parents from different backgrounds who shared both their accomplishments and struggles when it comes to being involved parents. I was deeply moved when Tamara, a working mom of one, told us how she was determined not to let her sudden job loss affect her relationship with her daughter. Tamara’s new job often requires night and weekend hours, limiting their quality time together. Tamara Austin talks with Commissioner of Education Pam Stewart during a Parental Involvement Round Table. But Tamara is resourceful. When she can’t be involved in the classroom, she works with her daughter’s teachers over email and by phone. And, when she’s at home, she lets Lauren choose their activity. Natalie’s life also changed dramatically this year when she and her husband decided to transition all five of their children to public school. As a long-time homeschooler, Natalie is hands-on with her children’s education, but felt that choosing public school would allow her to spend more quality “mom” time. Doug, a working dad of one, shared with the group that he often has to be persistent when it comes to staying involved with his daughter’s education. He found eating dinner every night as a family keeps them connected. Our fourth participant, Allison, said that she tries to encourage her three children’s educational pursuits, no matter how gross they might be. She kept us all laughing as she detailed her daughter’s love of bugs. But, the most poignant moment came at the end of our discussion when I asked Allison about her current struggle to get information about her son’s progress in school. “I remind myself that this is my child and I will do whatever I have to do to help him succeed,” she said. As we come to another important holiday this week, I am reminded by these four incredible parents that we have so much to be thankful for. At my family’s Thanksgiving dinner, when it is my turn to share what I am thankful for, I will be thinking about Florida’s incredible educators and the millions of dedicated parents who support them. On behalf of the Florida Department of Education, I want to wish you a happy and healthy Thanksgiving holiday. One of the greatest joys of my job is visiting schools where I can witness remarkable achievements happening in our education system. Today was a great example as I visited an elementary school in Miami-Dade. I arrived at Norwood Elementary School where Principal Dr. Kevin Williams convened a school assembly in recognition of learning gains for alternative assessment children and overall high achievement for all students at the school. Unbeknownst to Dr. Williams, he was actually planning for his own recognition ceremony. 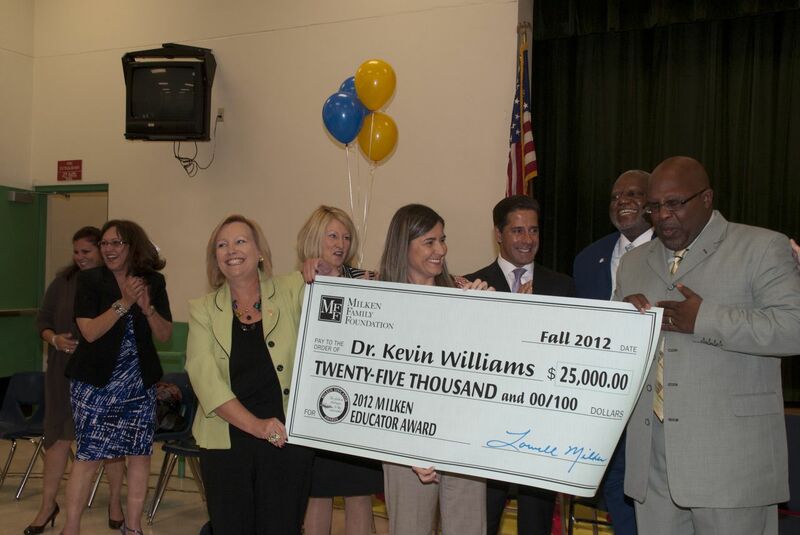 During the school assembly the Milken Family Foundation honored and stunned Dr. Williams with a Milken Educator Award. This is one of education’s most prestigious awards and comes with a no-strings attached cash prize of $25,000. Needless to say, the school assembly was roaring with enthusiasm and affection for a man who has profoundly transformed the lives of so many students, teachers, parents, and community leaders. It was a true honor to be a part of this celebration. As I travel around the state and visit schools I will continue to share my experiences and examples of best practices so together we make sure Florida students have the support they need to succeed. November is National Parental Involvement Month. As a mom and grandmother, I know there is no greater joy than watching your children accomplish their goals. As a former teacher, principal, and guidance counselor, I know how much I valued the support that parents, grandparents, and guardians offered my students at home. Parental participation is a key factor in predicting student academic success. In fact, it is twice as likely to predict academic success as other factors, including socioeconomic status. The earlier we get involved in our children’s lives, the more likely our actions will make a greater impact. That is why districts across the state are encouraging active school parents to mentor peers, sharing involvement skills and activities. Several school districts have opened parental assistance centers, forging seamless transitions between parents and the services they need for their children. This direct source of information is especially important for parents of exceptional education students and those falling behind traditional milestones. Later this month, I will be meeting with a group of parents from various backgrounds to discuss how they remain involved and engaged in their children’s lives and in their education. Sharing their best practices is part of what we are doing at the Department of Education to recognize the importance of parental involvement. Together, teachers and parents, districts and communities, can help ensure that Florida students have the support they need to succeed.